A highly competitive benefits package could be yours. Healthcare options: You’ll have your choice of several comprehensive health plans - administered through CIGNA. Premiums are subsidized by Legal & General America. Dental plan: Dental coverage is provided by MetLife and again, premiums are subsidized. Vision plan: Coverage for glasses and contact lenses is available on a voluntary basis through VSP. Group Term Insurance: Coverage equals two times your base salary and Legal & General America pays the premium. As your salary grows, so does your coverage amount. Individual Term Insurance: Individual, fully underwritten, Banner or William Penn policies are available to our employees and their spouses at rates lower than our publicly advertised premiums. You can have part of your salary deducted on a pre-tax basis to pay for anticipated medical or dependent care and thereby reduce your out-of-pocket expenses. Because we recognize the importance of providing the opportunity for rest, recreation, personal activities and health concerns, our company offers a variety of leave programs. Holidays: All employees have seven national holidays and two “floating” holidays to use at their discretion. Vacation: New employees can earn 10 working days annually which increases based on length of employment. Personal Leave: Personal hours can be used to take care of personal business that must be accomplished during the work week. Health Leave: Our health leave is generous. You accrue leave at a rate of two weeks per year. After five years, you’re allowed three. The leave accrues by pay period. Other leave plans include: Bereavement Leave, Military Leave, Family Medical Care Leave and Jury Duty Leave. Legal & General America offers two outstanding plans that help employees achieve their financial goals for retirement. 401(k) Savings Plan through Schwab Retirement Plan Services: The Company matches your contribution dollar for dollar up to six percent of your base salary. You can begin contributing on the first of the following quarter after you have been with us 90 days. Cash Balance Plan: Once eligible, pension benefits are credited each year based on your years of service to the company at a rate of 4 to 8 percent of your annual base pay. Interest is also paid on existing balances. Volunteer time paid up to 2 days a year for approved charitable work. These programs provide employees with income protection should they become unable to work due to serious illness or injury. Short-term disability pays a portion of base salary for up to 26 weeks. Long-term disability pays a portion of base salary and may commence after six months of continuous disability. Employee knowledge, skills and professional growth are critical to the continued success of our company. We offer a variety of programs to help employees become more proficient in their current positions as well as advance their careers with us. Your mental health is as important as your physical, so the Company provides an Employee Assistance Program through an outside confidential source. The program provides guidance/assistance on a variety of personal issues such as child and elder care, finances, stress, conflicts, marital issues, etc. The description above is a brief summary of the benefit plans provided by Legal & General America, Inc. and its subsidiaries, is not a contractual document and is subject to change. Full details are made available to employees at time of hire and occasionally updated. Specific provisions and administrative procedures may apply. The primary goal of the Legal & General America wellness program has been to foster a community in which every employee is encouraged to lead a healthy and enriched lifestyle. Through the active engagement and mutual support of our employees, we have genuinely improved overall awareness and health at our company. Our foundational objective is focused on the proper tools and education essential to any healthy lifestyle. Disease prevention and preparedness were promoted in-house through annual flu shots, vision testing, pulmonary function tests, and Dermascan screenings to pinpoint sun damage. Proactive employees attended seminars appealing to the mind and body that covered topics from exercise tips to juicing recipes. Among the most popular included "Stress Management 101," which centered on achieving the right balance between personal and time management and effective ways to cope with the physical and emotional wear and tear caused by stress, including breathing exercises, healthy diet, and keeping a sense of humor. "Quick and Easy" similarly attracted employees on the move searching for nutritional, 20 minute meals, quick and healthy snacks, and desk-ready exercises. Legal & General America was recognized by Frederick Regional Health System, the Frederick County Health Department and the Frederick Chamber of Commerce for our commitment to improving employee health and well-being. 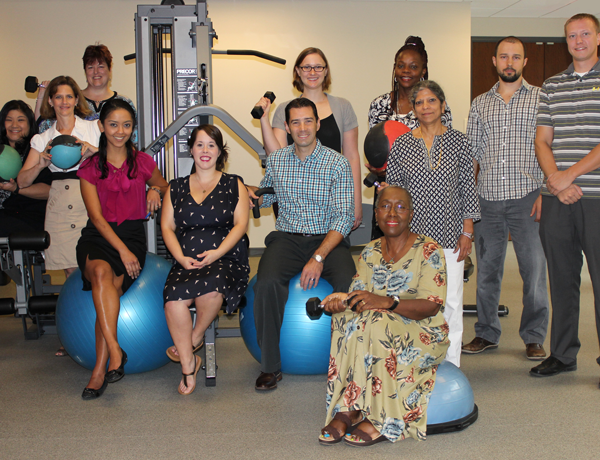 In 2015, the Company received the Gold-level Healthy Workplace Award.